Their brewery, located in Stapleton, Staten Island was called the Atlantic Brewery. According to a document called “One Hundred Years of Brewing,” published in 1901, the origins of the brewery date back as far as 1854. …In the succeeding year (1854) brewery vaults were built at Stapleton, S.I., and used for storage by Bernheimer & Schmid of Four Corners, until 1865. Krug & Bach then commenced to brew beer upon their site, the vaults and the brewery being the foundation of the plant now conducted by the Rubsam & Horrmann Brewing Company. The firm of Rubsam & Hormann was formed in 1870. This original plant consisting primarily of wooden frame structures was destroyed by fire in 1878. This March 22, 1878 story in the Brooklyn Daily Eagle described the fire and resultant damage. 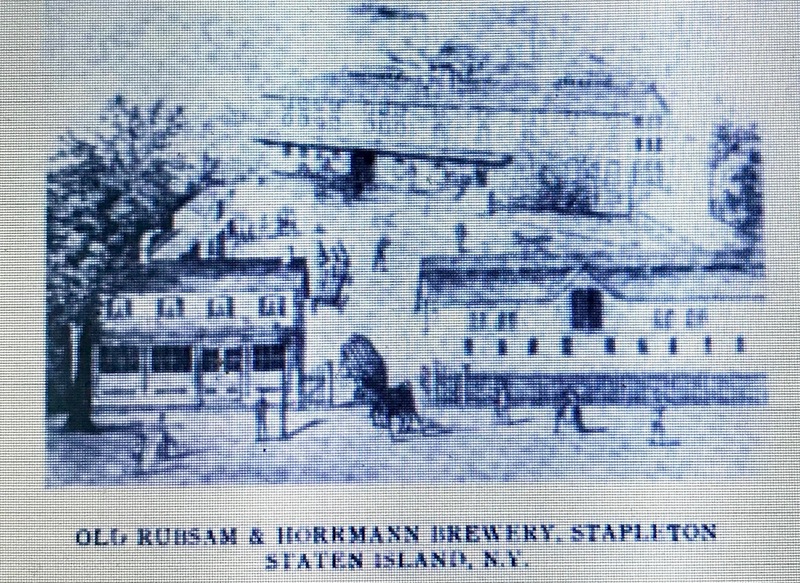 The large brewery of Rubsam & Horrmann, at Stapleton, Staten Island, which was destroyed by fire yesterday morning caused damage to many houses that were injured by fire and water. The wind was high at the time and sparks were carried a great distance setting fire to several buildings, among others to Mr. Rubsam’s residence which was destroyed. The brewery and two ice houses were burned and the ice was spared simply because it could not burn. The loss is estimated at $250,000 partly covered by insurance. Mr Rubsam’s loss on his residence is $15,000. The loses are partly covered by insurance. The fire broke out in the mill used for grinding malt, and is supposed to have been caused by the undue heating of the malt. The brewery building was situated about a half a mile distant from the ferry landing , between Boyd and Canal Streets. The 1886 Staten Island directory, the earliest I have access to, continued to list Rubsam & Horrmann on Canal Street so apparently the brewery was restored rather quickly and at or near the same location. The restored brewery is shown in these two old photographs, the first is dated 1895 and the second from a slightly different angle is undated. One feature not visible in the photographs was the brewey’s storage vaults that according to “One Hundred Years of Brewing” pre-dated the plant. Fortunately, they were described in a 1908 feature on Rubsam & Horrmann published in the May 23, 1908 edition of the Staunton (Virginia) Daily Leader. They are huge caverns burrowed in the side of Boyd’s Hill, the imminence on which the plant stands. Here 40,000 barrels are always in storage, which insures proper aging of the beer. The brewery also featured three artesian wells. The water is the purest. It is secured from three artesian wells sunk on the grounds and is of the fine quality for which Staten Island is famous. The Staunton Daily Leader feature went on to describe the beers produced by the brewery at the time. Three grades of beer are brewed, the regular lager, the “Standard,” a dark brew, and the “Pilsner,” a light. For the “Standard” only hops, malt, yeast and water are used. In the lighter beers rice is an element. Upward of 70,000 pounds of imported hops are required for these brews every year. The output is now (1908) 160,000 barrels a year more than half of which is marketed outside the Borough of Richmond, throughout the other four boroughs of New York, in New Jersey, Connecticut and up-State in New York. The extent of the Atlantic Brewery plant is indicated by the fact that it employs, including the bottling works, no less than 150 hands. This 1915 advertisement still mentioned the three brands: Pilsner; Standard, now called Bavarian Standard, and Premium, which I assume is the regular lager mentioned in the story above. During much of prohibition Rubsam & Horrmann continued to operate manufacturing ice and near-beer. 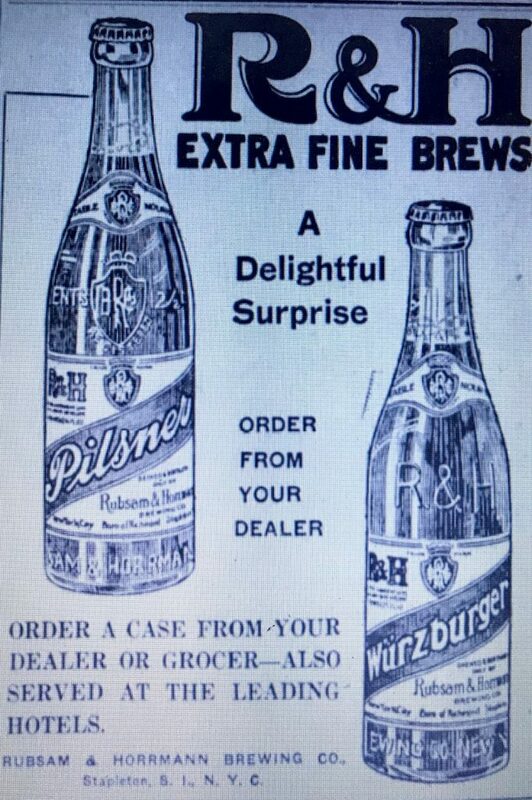 This 1923 advertisement, one of a series that appeared in New Jersey newspapers, was for two of their near beer brands being sold at the time, Pilsner and Wurzburger. In 1930 the brewery was once again damaged by fire. The September 5, 1930 edition of the Asbury Park Press described the fire. A century-old brewery, which since prohibition had manufactured ice and near beer, was wrecked by fire last night with a loss estimated by the owners at $1,500,000. 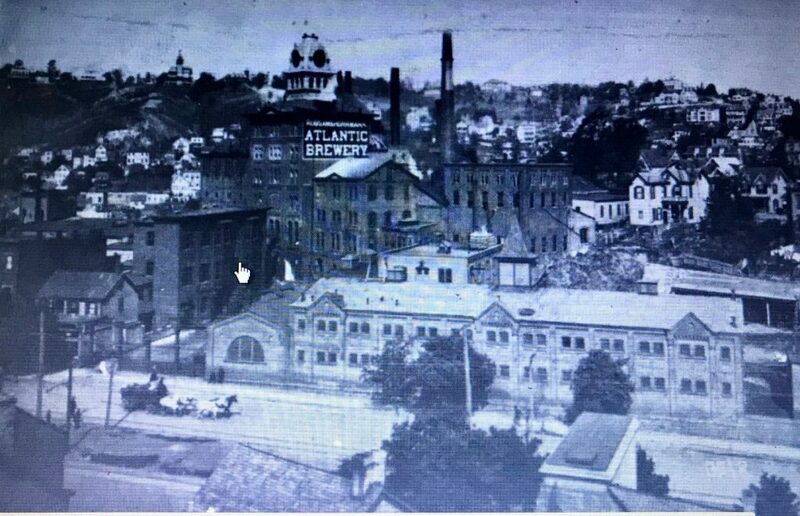 The plant known as the Atlantic Brewery and owned by Rubsam and Horrmann, covered an acre in the heart of Stapleton, S. I. Only the brick walls of the seven-story building remained. Included in the destruction was a tower housing a huge clock which with faces in four directions furnished time to residents for almost 75 years. The 1933 Staten Island Directory still listed the brewery office with a Canal Street address. By that time, recognizing Prohibition was coming to an end, a March 24, 1933 New York Daily News article indicated that improvement plans were in the works. 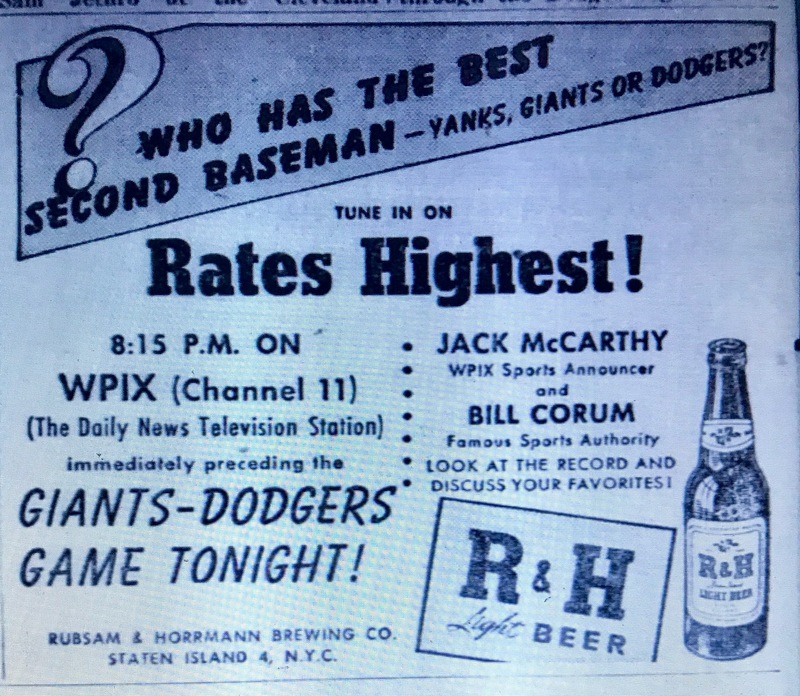 The Rubsam & Horrmann Brewing Co., 191 Canal Street, Staten Island, is awaiting action at Albany before determining how many new men to hire, but is planning to spend $250,000 for new equipment. 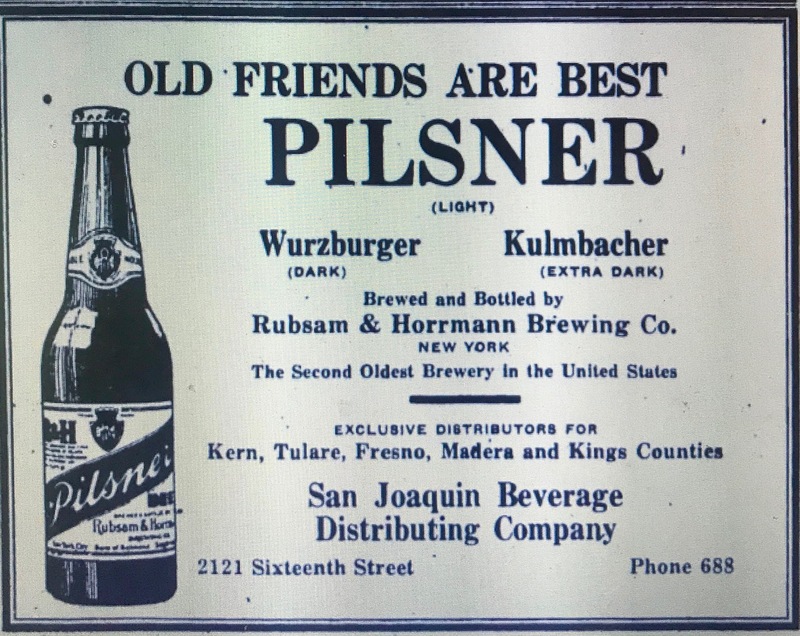 Less than three months later, the company’s brands were being advertised as far away as California under the heading “Old Friends Are Best.” This advertisement appeared in the June 17, edition of the Bakersfield Californian. They didn’t confine themselves to sports either. 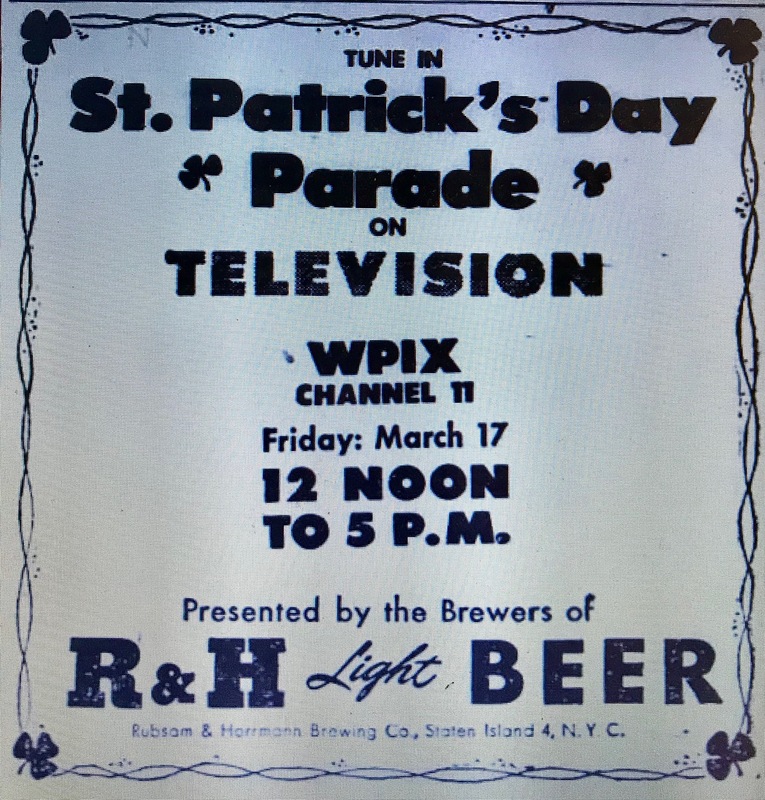 In 1950, they sponsored the broadcast of the St Patrick’s Day Parade. 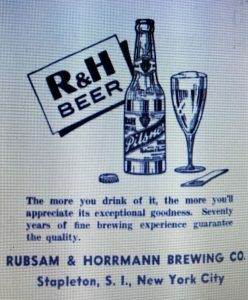 In December, 1953 Piels bought the Rubsam & Horrmann’s brewery as well as their R & H label. The sale was reported in the December 14, 1953 edition of the (Allentown Pa.) Morning Call. 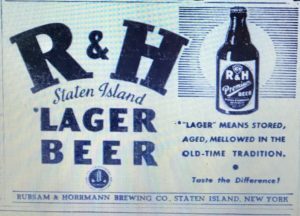 Piel Bros., one of New York’d oldest brewers has acquired Rubsam and Horrmann Brewing Co. of Staten Island. Piel plans to use new plant capacity to serve distributors in lower New Jersey. Smith attributed the decline in earnings to reorganization plans begun in October, 1962, with the closing of the company’s Edelweiss plant in Chicago, followed last January with the closing of the Staten Island plant of Piel Bros. 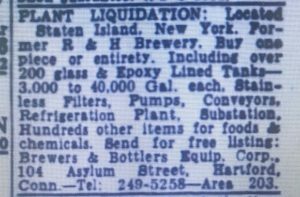 The liquidation sale notice signaling the end of the brewery was printed in several July, 1963 editions of the Wilmington Delaware News Journal. The sale appeared to have included the brewery’s machinery, equipment and contents. Today, the area between Canal and Boyd in Stapleton includes a relatively recent development of attached residences. Other areas are vacant. As far as I can tell, there is no sign of the former brewery buildings. I’ve found two R & H bottles. The first is a mouth blown champagne, actually embossed 11 3/4 oz., with a blob finish. The second is machine made, 12 1/2 oz champagne style. The style and embossing exactly match the bottles shown in the 1923 prohibition era advertisement pictured previously. The bottle most likely dates no later than the prohibition era. Post prohibition advertisements no longer feature the champagne style bottle but exhibit the export and stubby style instead. The advertisements below were from 1935 and 1939 respectively. The F & M stand for brothers Frederick and Maximillian Schaefer. 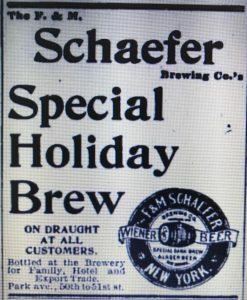 A story marking Schaefer’s 100th anniversary in the March 22, 1942 issue of the Brooklyn Daily Eagle stated that they were one of, if not the first, to brew lager beer in the United States. The founders (Frederick and Maximillian) really knocked the cognoscenti of their day cold when they put their first brew upon the market. In 1842 beers were of the “top-fermented” type such as ale , porter and common or still beer. The Schaefers introduced the sparkling, lighter-bodied product. It was served cold rather than at room temperature. It was called “lager beer” because it was “lagered,” rested in cold storage. The start of the business was told in a New York Times item published in their June 7, 1885 edition. Mr. Fredrick Schaefer – The F. Schaefer whose name appears in the name of the present company, is a native of Wetzlar, Prussia, and was born in 1817. In 1838, when just 21 years of age, he came to this country, and being a thoroughly practiced and experienced brewer he quickly obtained employment in the brewery of Mr. Sebastion Sommers, who at the time owned an establishment between eighteenth and nineteenth Streets, on Broadway, where now stands the well-known Sloane’s carpet store. In the following year-1839- Mr. Maximillian Schaefer, a brother to Frederick, also arrived in this country, and by his exceptional industry and rare business capacity speedily acquired sufficient insight into the commercial methods of this country to warrant his starting in business on his own account. In accordance with this determination the two brothers bought Mr. Sommers’s brewery on Broadway in 1842 and carried on the business there for two years. 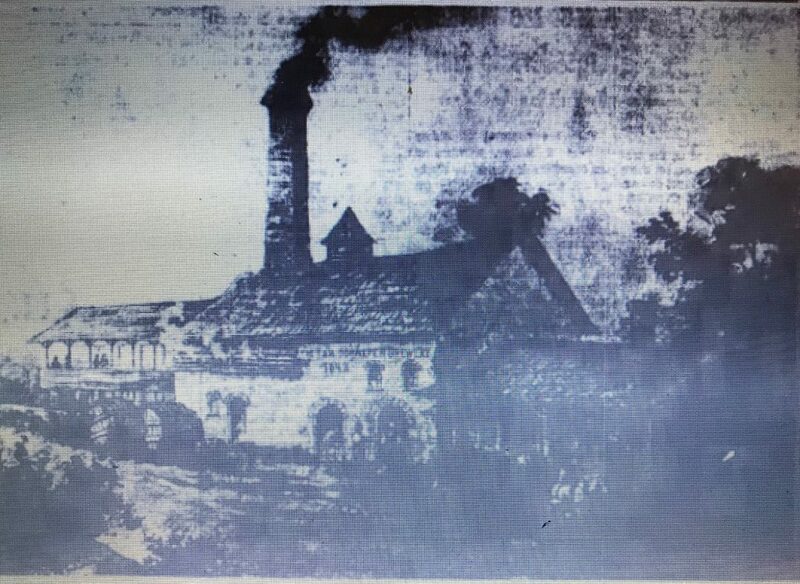 I couldn’t find any mention of the original Sommers Brewery in the NYC directories but a story about Brooklyn breweries in the April 26, 1940 issue of the Brooklyn Daily Eagle included a picture of the original Schaefer Brewery in 1842. Oldest brewer of lager beer in the United States is the Brooklyn concern, F. and M. Schaefer Brewing Company. This is how the plant looked back in 1842 when it first began serving the nation’s thirsty. F & M Schafer (no e), brewers was listed on Seventh Ave in the 1847/1848 Directory, however they’re address was given as “85 & 87 Ave 7” not 109 and 111 as mentioned in the story. They remain listed on 7th Avenue (85-91) through 1863. F&M Schaefer began listing E 51st Street & Fourth Avenue as an address in 1857 (Fourth Avenue was later renamed Park Avenue). Between 1857 and 1863 the company listed both the 7th Ave and 51st Street locations as addresses. In 1864 they dropped the 7th Avenue address. On the 4th of February, 1878, the firm was organized into a joint stock corporation. It was first listed as the F & M Schaefer Brewing Company in the 1879 Directory at the 51st Street address. The company have also recently erected a large four-story building, 44 by 75 feet, on the north side of 51st Street, where their ice machinery is located. No ice whatever is used, a gigantic ice machine taking its place. This machine was built by the Consolidated Ice Machine Company, and has a capacity for cooling equivalent to 125 tons of ice per day – all on one floor. Previous to this no less than 15,000 tons of ice were consumed by the company every year. The company was one of many profiled in a special section on “Business and Commerce” in the May 23, 1908 edition of the Staunton (Va.) Daily Leader. The feature described the three types of beer that the company was brewing at the time. Three kinds of beer are brewed – “Wiener,” very light in color; “Lager,” an amber-colored beer, and their “Special Dark,” which is highly recommended by physicians for its nutritious qualities. The “Wiener” and “Special Dark” are unsurpassed in this country, while the “Lager” compares very favorably with other popular brews. These beers are also bottled for hotel, export and family trade. The bottling is done directly from the vats, which are under government supervision. The business remained at the 51st Street location until the mid-1910’s when they decided to move across the East River to Brooklyn. 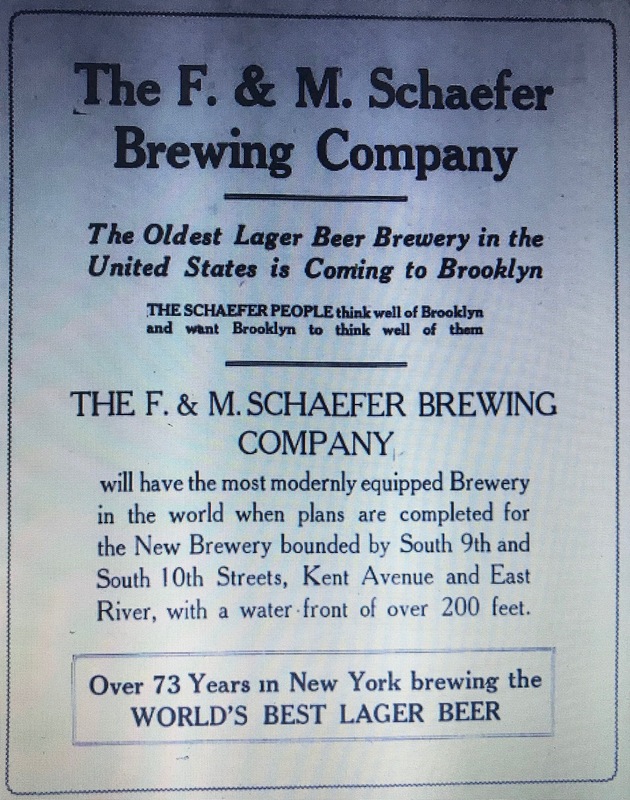 An article in the “real estate” section of the May 29, 1915 issue of the Brooklyn Daily Eagle introduced the upcoming move and two weeks later Schaefer took out an advertisement in the Eagle introducing themselves to Brooklyn. Another industry is to be added to the rapidly growing commercial center in the vicinity of the Williamsburg Bridge. No movement in the past ten years has been so marked as the demand for factory sites in this locality and the decision of the F & M Schaefer Brewing Company to abandon its present plant on Park Avenue and Fiftieth Street, Manhattan, for a more accessible location at the Brooklyn waterfront is further proof of the value of the section for business purposes. The new Brooklyn plant opened in June 1916 and the old Manhattan plant was sold off in parcels. Prior to National Prohibition I didn’t find many Schaefer newspaper advertisements. One I did find was for their Wiener Beer entitled “Special Holiday Brew” put out during the 1893 Christmas season. 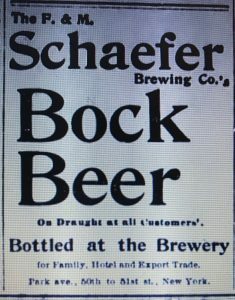 Another advertisement that was pretty common between 1893 and 1906 referred to their Bock Beer and made a point that its bottled at the Brewery. The Brooklyn plant stayed open during prohibition making cereal beverages and manufacturing artificial ice and dyes. Their license to brew beer after Prohibition was posted in a June 1933 issue of the Brooklyn Daily Eagle. A man may have a poor memory for faces, but he never forgets the first time he is introduced to a glass of Schaefer. By 1938, Schaefer was selling one million barrels per year and in 1944, two million. They purchased the Beverwyck Brewery Company in Albany, NY in 1950 and in the 1970’s acquired the rights to the Piels label. 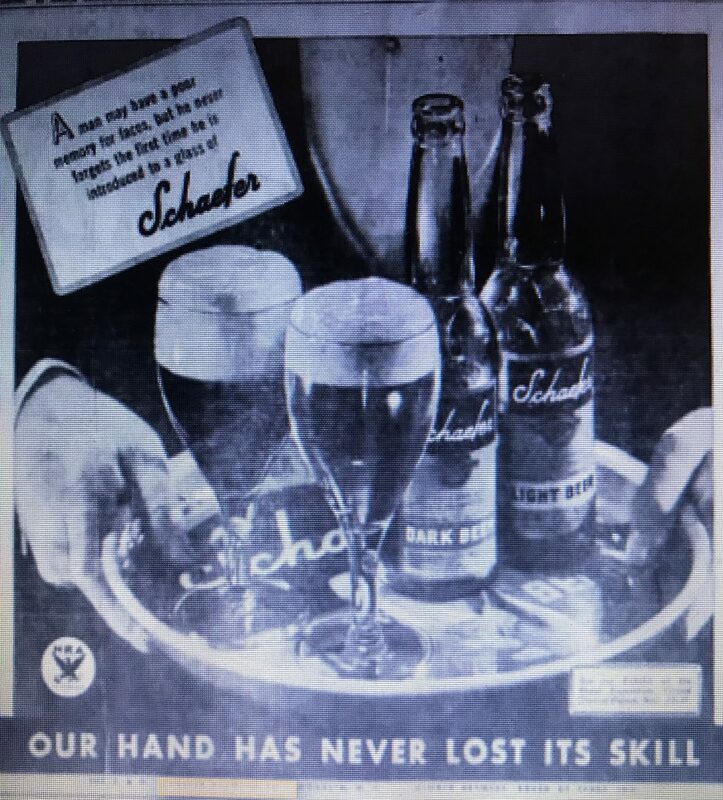 Between 1950 and 1970 Schaefer was one of the top selling Breweries in the nation and in 1968 the company went public. The F. and M. Schaefer Brewing Co., New York’s only remaining brewery has announced it is moving to Allentown Pa.
Schaefer Chairman Robert W. Lear said about 850 workers will lose their jobs as a result of the move. Blaming mounting production costs for the closing, he said brewing operations for the company’s Schaefer and Piels beers would be consolidated at the firm’s new Lehigh Valley plant in Pennsylvania. Lear said at a news conference at the company headquarters Thursday that the move was “dictated by financial losses caused by excessive and increasingly rising cost of brewing beer at our Brooklyn plant. Major factors in the move, he said, were the obsolescence of the plant, the high cost of utilities, municipal services and taxes and a high labor intensity factor resulting from inefficient plant layout. 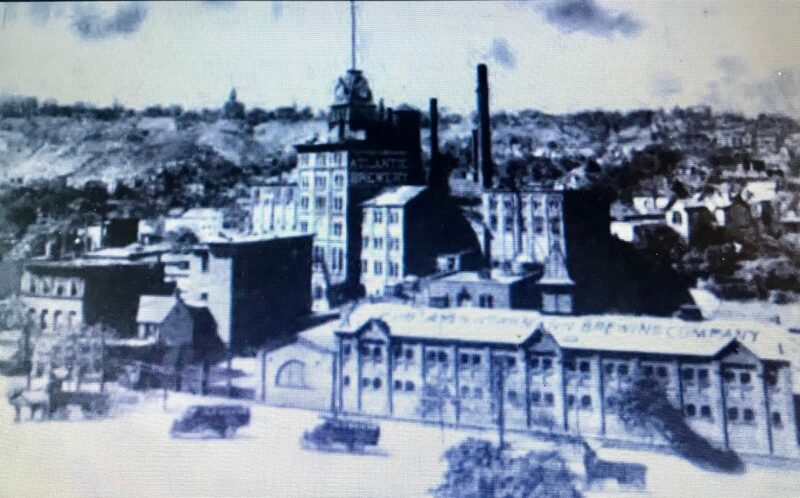 The Schaefer family sold to the Stroh Brewing Co in 1981 and Stroh was later absorbed by PABST who retains the license to Schaefer and sells a reformulated brew to niche markets today. The Allentown facility is currently owned by the Boston Brewing Co who makes Sam Adams. There’s no longer any sign of the Schaefer complex in Brooklyn. The former brewery site bounded by 9th and 10th Streets, Kent Avenue and the East River is now part of a waterfront park. 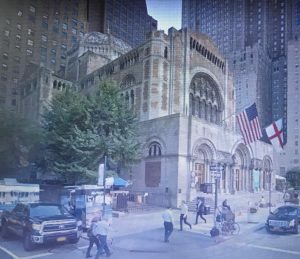 In Manhattan, St Bartholomew’s Episcopal Church purchased the portion of the brewery site on Park Avenue between 50th and 51St Street and built the church that remains there until today. It opened to the congregation in 1918. 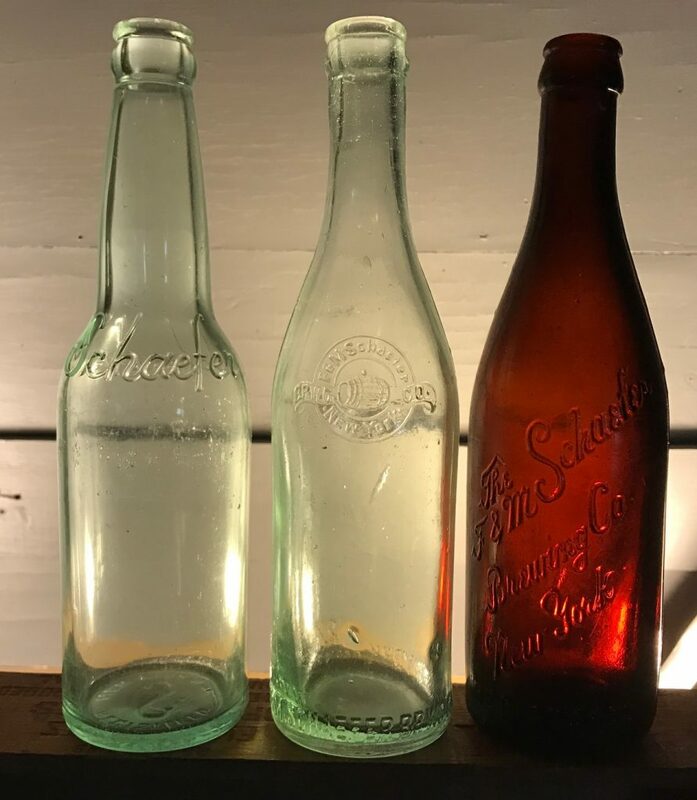 I’ve found three different styles of bottle. Two are champagne styles with a tooled crown finish. One is brown with the company name written in script and the other aqua with the company name and beer barrel insignia embossed on the front. 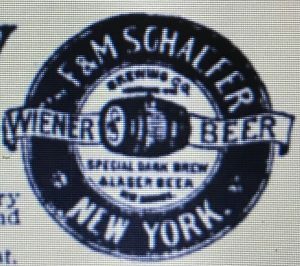 The beer barrel insignia is similar to the one in the 1893 Christmas advertisement shown above (but the banner substitutes the words “Brewing Co.” for “Wiener Beer”). The third, export style, is machine made. The machine made export was certainly made after 1916 when they modernized in Brooklyn. 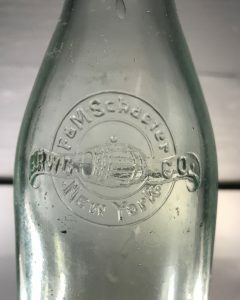 The bottles are all embossed New York as opposed to Brooklyn, so it looks like they never changed the embossing to reflect the Brooklyn plant. M. Bacci, Italian-American Bottling Co., 451-455 Pearl St., N.Y.
Louis Bergdoll Brewing Co., Philadelphia, Pa.
S. Casella & Sons, 84 Huyler St., Hackensack, N.J.
Kirsch & Herfel Co., Inc., Brooklyn, N.Y.
Peter Hauck & Co., Harrison, N. J.